Other Voices, 3.1 (May 2007), Manual of Lost Ideas - Institute for Cultural Inquiry. The Manual of Lost Ideas is an historical manuscript of largely unknown origin. 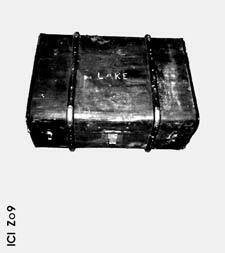 The Manual found its way to the Institute of Cultural Inquiry (ICI) in 1955, arriving in a suitcase with the word "LAKE" painted on its side. It was accompanied by a typewritten commentary ostensibly written by an Anglo-German named Arturo Ott. A note inside the suitcase identified it as an anonymous bequest, although the ICI has reason to believe that it was sent by Arturo Ott or someone in his household. This site offers an overview of what is presently known about the Manual, together with a sample of pages from the manuscript, including a number that have never been made public before. Extracts from the Manual were published in 2002 in the ICI book Benjamin's Blind Spot, but this is the first time MLI materials have been made available on the Web. The ICI hopes that this will help facilitate further research on the Manual.